Rapid-Hite offers Operators Balance Control (OBC) by letting the operator change the height of mowing level within seconds by the arm control lever at your finger-tips. 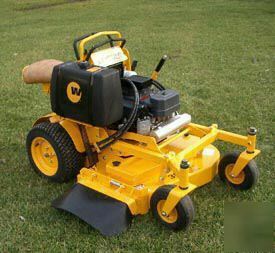 Now you can change the height of the mowing level without adjusting shims. Cutting Height Range: 1.0"- 5.0"
All items are new in the box. Local Pick-Up only or we can drop off in North or South Carolina. Contact us at , or call .